HAYS, Kan. -- As Dean of the College of Business and Entrepreneurship at Fort Hays State University, Dr. Mark Bannister is accustomed to students looking up to him. But Bannister, entering his 14th year at FHSU, found himself craning his neck upward at a recent awards ceremony on campus while having a word with incoming freshman Jared Vitztum. Vitztum, a Hays native who graduated from Thomas More Prep-Marian High School last weekend, was one of just a handful of high school students attending a college ceremony in late April where students in the College of Business and Entrepreneurship were honored with scholarships for the coming year. He was on hand to accept a $2,000 achievement scholarship awarded to an incoming freshman, then moved to the FHSU backdrop where a photographer was taking photos of all the winners. Bannister stepped up to the backdrop and looked up -- and up. Do you play basketball, wondered Bannister, an avid Tiger basketball fan and longtime season ticket holder. Vitztum smiled and posed for the photo, towering over the 6-foot, 1-inch Bannister. As a matter of fact, Vitztum does play basketball. And next year, Bannister was pleasantly surprised to hear, the 6-foot, 7-inch-and-still-growing youngster standing next to him will be wearing the black and gold of Fort Hays State. About two weeks later, Vitztum, who averaged nearly 20 points and 11 rebounds for the Monarch boys' basketball team this season, signed a national letter of intent with the Tigers. Those numbers, called a double-double in basketball, could make any coach smile, and his academic stat sheet is just as impressive. Since teachers at O'Loughlin Elementary School moved Vitztum up to first grade early in his kindergarten year back in 2004, he has recorded a perfect 4.0 grade point average every year since. Considering Vitztum's athletic talent, height and youth -- he won't turn 18 until June 4 -- along with his academic resume´, Bannister welcomes the chance to look up to the future Tiger. "I'm excited to get such a well-balanced young man," Bannister said. "He's an excellent student and an outstanding athlete." While Bannister is looking forward to adding another high-achieving student to the College of Business and Entrepreneurship, Matt Means is ready to welcome Vitztum into the Honors College fold. The Honors College is comprised of a group of FHSU students who are offered enhanced curriculum and research opportunities as well as leadership development. They get the chance to network on a deeper level while living on the same residence hall floor as other Honors College students. Means has had other athletes in the Honors College and thinks that involvement enhances the student-athlete's educational experience. "Within reason, we find that busy gifted students are actually more successful academically," said Means, director of the Honors College, "because the time management, prioritization and leadership skills necessary to balance these interests help them maximize impact and effectiveness. " Mark Johnson, the Tigers' head men's basketball coach, can be added to that list of FHSU personnel anxious to get Vitztum on campus. Johnson expects all those aforementioned qualities to translate to the court. "His best basketball is ahead of him as he continues to improve his skills and mature physically," Johnson said. "And he may not be done growing. He hasn't come close to hitting his ceiling." While Johnson is in the business of winning basketball games, he knows there are a lot of benefits of having a top academic student on his team, too. "He's a tremendous student, well rounded. He's exceptional in the classroom," Johnson said. "He's a person of high character. He fits everything you look for in a student-athlete." Vitztum, who scored a 31 on his ACT, earned numerous academic scholarships, including one through the Honors College. Coincidentally, Vitztum will be joined in the Honors College this year by a high school classmate -- Morgan Weber, another member of TMP-Marian's class of 2016. "While the majority of our Honors College students come from locations outside the Hays/Ellis County area, it always is a source of pride for me when we have local students who join our program, " Means said. "Both Jared and Morgan exemplify what the Honors College is about: diversity of strengths paired with excellent communication skills, exceptional intellectual accomplishment, strong leadership potential and ability to impact, and a curious, humble and giving personality. " The fact that their only son, a middle child of three, gets to continue his basketball career in front of lots of family and friends, is also a plus for Vitztum's parents, Brian and Tina Vitztum. "That's exciting for Tina and me," Brian Vitztum said. "Fort Hays State is a great school academically, and we get to see our kid evolve in front of us." Vitztum had offers from several other colleges recruiting him to play basketball, including MIAA conference rival University of Nebraska-Kearney. However, Vitztum pointed to several factors that kept him close to home. "I really wanted to play basketball in college, and I wanted to find a school with a good finance program," Vitztum said. "Fort Hays State gave me the opportunity to do both of those." Vitztum also wanted to play with a winning program, which he found at FHSU. Johnson has had just one losing season in his 15-year stint as the Tigers' coach and owns a 304-138 overall record (.688 percentage). That includes nine 20-win seasons and seven NCAA tournament appearances. Vitztum keeps alive a family tradition as several members of his family -- including his mother, a grandmother and one set of great-grandparents -- are Fort Hays State graduates. Numerous relatives live in Hays. "It will be awesome for the support, having a lot of people there at games," Vitztum said. "It'll be fun. I'm pretty excited." "We've been so fortunate here the past few years to get quality athletes from the area," Johnson said. "You can't take guys just because they're local. They have to be good enough to play and really help the program, and we've had several local and area kids who have done that." Next in line to assume that role is Vitztum, a forward who can shoot the 3-pointer, with the ball-handling skills of a guard. "What I really like about him is his footwork," Johnson said. "He moves like a basketball player -- not just a good athlete, but a basketball player. And it doesn't matter what position he's playing." Feelings were mutual for Vitztum. "I liked the coaching staff, thought I fit in well with their system," Vitztum said, "and I knew a lot of players on the team. Things just clicked." 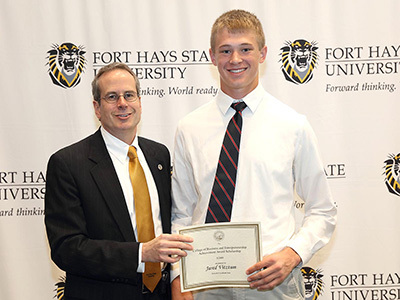 Cutline: From left are Dr. Mark Bannister, Dean of FHSU's College of Business and Entrepreneurship, and Jared Vitztum, incoming FHSU freshman.